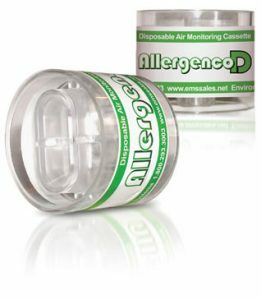 Allergenco-D Disposable IAQ Air Monitoring Cassette (box of 50) - SanAir Technologies Laboratory, Inc. Peer reviewed study by the University of Cincinnati’s Environmental Health Foundation confirms Allergenco-D’s design provides superior results! Go to our Technical Information section and download the report today! Higher Collection Efficiency Than Other IAQ Slit Impactor Cassettes.